Hendybadger over at Tales of A Tabletop Skirmisher continues the previews for the upcoming Marvel Universe Miniatures Game (MUMG) from Knight models. 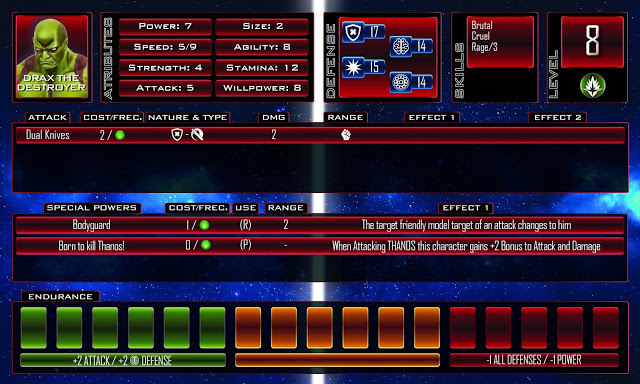 This time around we get a peek at a stat card (particularly, Drax the Destroyer's). But more than just looking at a bunch of stats without context, we get a breakdown of what everything on the card means as well. Looking over the explanation of the stat card, it looks like Knight Models, while not porting over their Batman Miniatures Game rules, directly, one can see where they have a sort of "same style" with the rules here. Characters get Power tokens that they can spend during their turn. They have different defensive values depending on what type of attack is going against them. Size matters when it comes to being thrown. As we'd been told before, it's a 2d8 system, so you can see what a character's stats look like that an enemy would try and overcome, or that you'd be adding to your dice roll to see if you hit your opponent. Good looking stuff. I've been told there won't be a preview tomorrow, but we will be getting another one on Wednesday. So be sure to check back.